If I talk about flavor too much on this site, I wish I could be sorry. I’m a sucker for big, bold, bright, salty flavors and I’m not afraid to admit it. I think this is a result of having to cut back on sweets; they say you can “retrain” your taste buds and I used to think that was, quite frankly, BS, but it turns out that your taste buds are just tiny puppies living on your tongue waiting for you to take them to obedience school and teach them how to stop chewing the carpet and/or craving sugar. But, once a comfort eater, always a comfort eater, I think. At least that has been my experience. When I’m stressed or tired, I used to crave sweets and now I crave salty comfort: nut butters, roasted veggies (at least the way I make them, with an extra-generous sprinkle of salt), and olives. Like carrot cake, I hated – and I do mean hated, as in was repulsed by – olives growing up. But as is abundantly clear by my inability to consume a salad without them, and my propensity to add them to my dinner entree, a flip switched one day and I did an inexplicable 180 from nearly barfing from being near one (what can I say? I was a picky eater and a dramatic child) to not only tolerating them but buying them in cartoonishly-oversized jars from Costco. And eating tapenade straight from the jar. I put it on bread for the photos so you all wouldn’t know what an animal I am when it comes to olives, but I guess the jig is up now. One you try this, you’ll understand. It’s incredibly chunky and salty and herby because this version goes a little heavy handed (or, rather just heavily-handed enough) on the fresh flatleaf (Italian) parsley, to balance the salt. Traditionally, olive tapenade is made with sardines (or, sometimes, anchovies, I think), but that is one childhood aversion I haven’t been able to move past (yet, but I’m trying. Does anyone have any great sardine recipes? Please leave them in the comments below! Shrimp too! ), so I make my tapenade without the oily little fish. I use capers instead to round out the flavor a bit, so this version is suitable to vegans and vegetarians too. As for serving, try it on bread, crackers or veggies; as a spread on a sandwich, or with a fatty, creamy cheese to cut the saltiness. 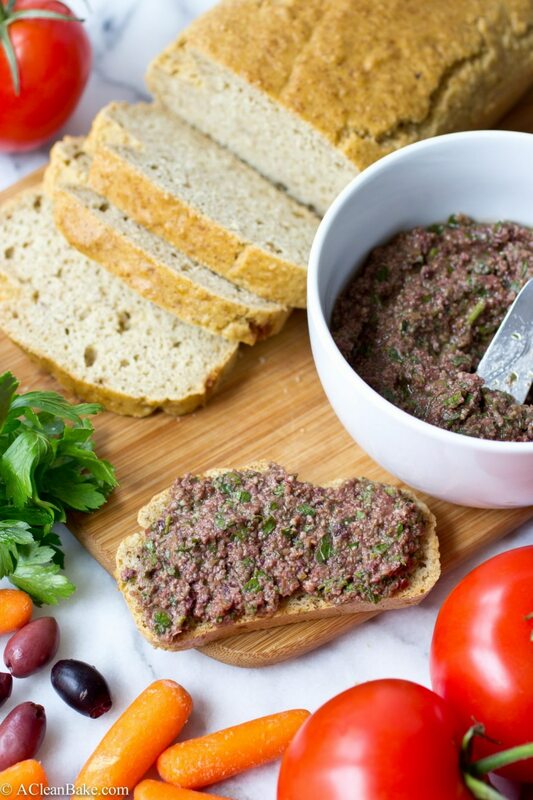 It works best in a variety of applications, but since we’re barreling into burger season, make sure to come back to the site tomorrow for a great burger recipe that pairs really well with this olive tapenade! Combine all ingredients in a food processor and pulse until chunky. Add olive oil, 1 Tbsp at a time, and process until the mixture reaches your desired consistency. I only used 2 Tbsp oil because I like a chunky relish-like consistency, but if you want a smoother dip-like consistency, use more oil. If you'd like a smoother consistency, try making this in a high speed blender. You can try subbing 1-2 anchovy fillets for the capers, if you prefer. This is going to sound reeeeeeediculous, but I didn’t realize tapenade had anchovies in it! I’m definitely a comfort eater and could easily see myself indulging in slice after slice of bread + this tasty tapenade. Now you’ve got me craving olives at 7am. Well played, m’dear! Totally not ridiculous at all! 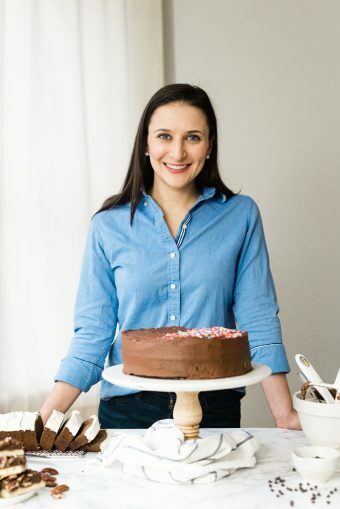 I didn’t realize it for a long time either, but luckily it is so easy to make at home, exactly how you like it! PS: It’s never too early for olives! Yay! 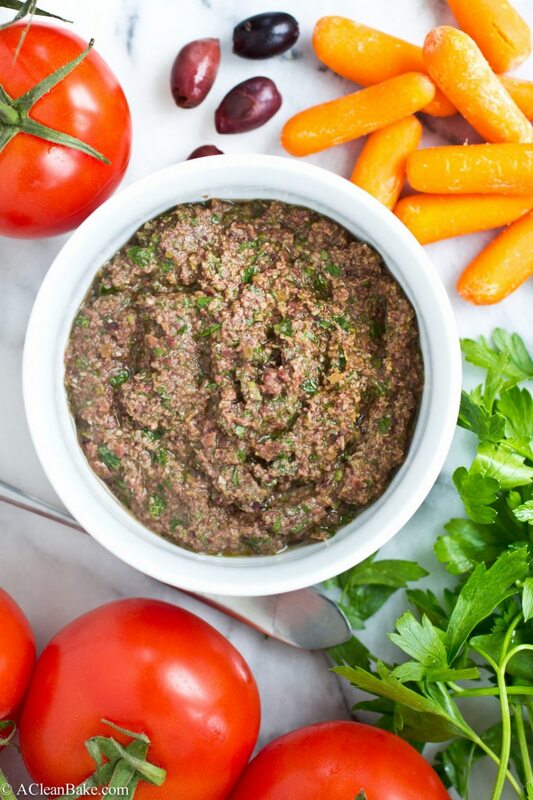 I have ALWAYS had to make my own tapenade because of the anchovies… and I’ve never missed ’em. This looks awesome! I HATED olives growing up, too! In fact, I still hate the black ones out of a can. I pick them off taco salads, pizza, anything. It wasn’t until I was in high school when my best friends were eating green olives that I finally gave those a chance and found out I loved their briny, salty flavor. Now, olive bars are one of my favorite places in the grocery store! 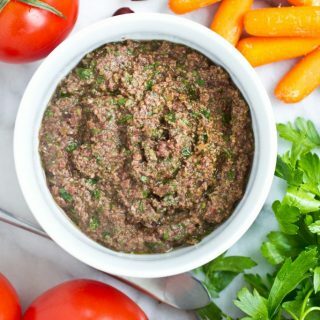 I’m not going to lie, I love anchovies and sardines, but this tapenade looks like it’s packed with so much flavor that it won’t even miss them! Oh, I am so with you: I can’t stand those black canned olives. I’m not sure I can even, in good conscience, group them in with the briney, tender, flavorful olives I love. An olive bar is one of the happiest places on earth (sorry, Disneyworld). OK THANK YOU SO MUCH for the sardine/anchovy ideas!! I totally trust you – this IS going to work. Consider me an anchovy-and-sardine-lover-to-be.